Cold temperatures, natural snowfall, and ski mountains with ample snowmaking capabilities all combine to make the Glens Falls Region a great place to live, or visit, if you love to ski. Check out some of the most popular ski resorts in the local area and beyond. At Gore Mountain, you can ski and ride nine sides of four unique peaks, all in one place. The mountain features 109 alpine trails and 14 lifts, making it one of the largest and most accessible ski areas in the North Country. However, that's not all Gore has to offer. 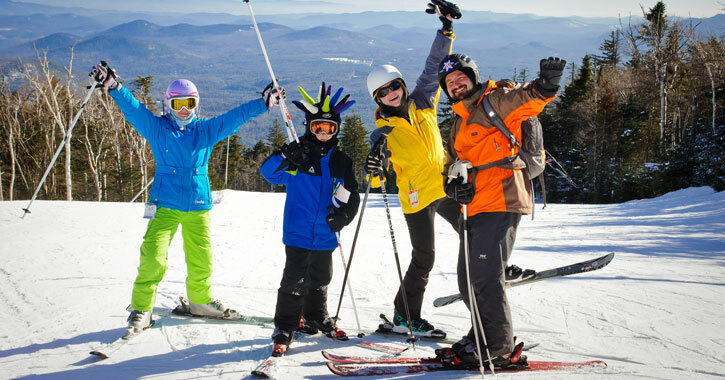 Whether it's your first time up the mountain, or you just need a tune-up, Gore Mountain's Snow Sports School is a great place for you or your family to take lessons no matter what your age or ski/snowboarding level is. Plus, Gore's Nordic Center at the adjacent North Creek Ski Bowl is a top choice for cross-country skiing and snowshoeing. West Mountain is the perfect winter sports destination for locals and tourists alike as it is the only ski resort within the Glens Falls Region. The medium-sized ski area is located a few exits south of Lake George Village and down the road from Exit 18. Offering 30+ trails that range from beginner level to challenging, West is perhaps the most family-friendly mountain around. For the non-skiers, there is a snow tubing park that both kids and adults can have a blast at. Come visit this Olympic mountain near Lake Placid! The best in the U.S. and around the world come to Whiteface to train and compete, but it's also a place where kids can learn for the first time and have fun. When you are at the top of this 4,000+ foot mountain, make sure you take in the views of the surrounding Adirondack peaks. Discover Oak Mountain and all it has to offer this winter. Not only is it a friendly mountain for skiers and snowboarders of all skill levels, but Oak Mountain also has a great Ski & Snowboard School for beginners. There are 22 trails, one quad chairlift, two T-bar lifts, snow tubing lanes, and miles of snowshoeing trails too. Best of all, it's conveniently located in the Southern Adirondacks, one of the region's hotspots for winter sports. Based in the Western Adirondacks, McCauley Mountain is a fantastic ski area. The summit features trails for beginner skiers and snowboarders, as well as more challenging trails for intermediates and experts. In total, there are 21 slopes and trails up to a mile long, a double chairlift and two T-bar lifts, and some rope tows. The site offers "big mountain" skiing without the long lines and high prices. Willard is a small mountain in Greenwich that is packed with family fun. Located just a short drive from Saratoga Springs, this ski site offers everything you need for your outdoor adventure. In addition to Willard's varied terrain and downhill skiing and snowboarding trails, the mountain is home to a snow tubing park that non-skiers will enjoy. There's a reason it's been called "New York's Coolest Little Ski Area." Considered Vermont's family-friendly ski mountain, Bromley is a place where everybody knows your name. The slopes here are kept in top shape, and the mountain features diverse terrain around its centralized base area. They also offer award-winning kid-specific programs for young skiers and snowboarders, as well as multiple terrain parks and trails for everyone to try. Killington Ski Resort is renowned around the world for its six peaks that offer 150+ trails and over 73 miles of terrain. Nicknamed "The Beast," this ski area boasts breathtaking views and plenty of ways to have an outdoor winter adventure. Don't worry about waiting in line - Killington has an extensive lift network to get you where you need to be. After a long day of being on the mountain, you can relax inside one of their lodges and maybe even get pampered at the Killington Grand Spa. Stratton Mountain Resort is another one of Vermont's premier ski areas. Featuring 97 downhill trails ranging from beginner to advanced, skiers and snowboarders of all skill levels are welcome. You can take a gondola ride up to one of their trails, enjoy cross-country skiing and snowshoeing tours, go snow tubing or dog sledding, and take a walk around the nearby village shops. From outdoor fun to extraordinary events, there is always something to do at Stratton in the winter.